You are here: Home › A Great Casita Maria Experience = 1 Workshop + 1 Performance in 1 Day! 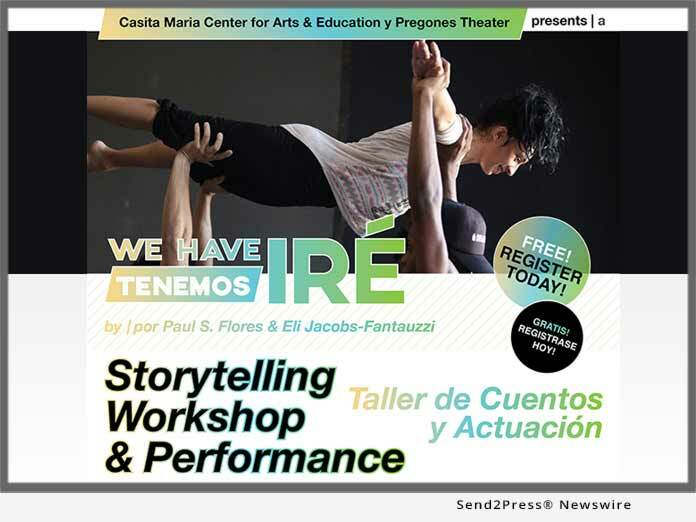 BRONX, N.Y., Feb 11, 2019 (SEND2PRESS NEWSWIRE) -- Casita Maria Center for Arts & Education, in partnership with Pregones Theater, is proud to present "We Have Ire," a free excerpt performance of the multi-disciplinary theater project, on March 9, 2019, 2 - 2:45 p.m. The performance combines spoken word and theater produced by Cuban-American writer, performer, Doris Duke; Artist and San Francisco resident Paul S. Flores; with live jazz music from artist Yosvany Terry; modern dance from Ramon Ramos Alayo; video projection by Eli Jacobs-Fantauzzi; and hip-hop beats from DJ Leydis. Directed by Rosalba Rolon. Before the performance, the public is invited to join Paul S. Flores, Eli Jacobs-Fantauzzi, Ramon Ramos Alayo, and Yosvany Terry for a storytelling workshop on March 9, 2019, 11 a.m. - 1:30 p.m. Participants will first learn to tell a fun and important first-person story about a tradition in the Bronx they want to continue, or that they want to understand better. They will then learn to integrate live or recorded music, dance, or video into their performance to create a multimedia story about traditions in the Bronx. March 9 is also the last day to see "We Have Ire: Afro-Cuban in the United States." This exhibition tells the story of Cuban and Cuban-American artists Flores, Terry, Alayo, and DJ Leydis, focusing on their influences and dreams through photography, video and cultural objects. "The Casita Maria Gallery is a powerful teaching tool and welcoming space of cultural celebration for the Young Artists of Casita Maria, their parents and caregivers, and the community. Through We Have Ir e we are thrilled to share Afro-Cuban and Cuban-American stories through so many artistic disciplines," says Gail Heidel, Director of Creative Arts Programs, Casita Maria Center for Arts & Education. Paul S. Flores' deep dive into themes of transnationality and citizenship comes at a crucial time in contemporary history. Flores creates plays and oral narratives that spur and support societal movements that lead to change. Flores's last play, "On The Hill: I Am Alex Nieto" brought together San Francisco communities that had been divided by gentrification and police violence. Flores' ability to paint a vivid picture of bi-cultural Latino experience is shaped by his personal background and experience growing up near the Mexican border. He began presenting spoken word as a founding member of Youth Speaks and Los Delicados in 1996. He performed for the first time in Cuba in 2001 while working at La PeÃ±a Cultural Center, and has since presented multiple times in Havana, Mexico and El Salvador. His comprehensive body of work touches on the immigrant story in all its complexities: from violent forced migration, gang life, war, incarceration and separated families-to zooming in on intergenerational relationships and the struggle of preserving important cultural values. Paul Flores's newest play, "Pilgrim Street," premiered September 13-16, 2018 at Z Space Theater in San Francisco. His next play, "We Have Ire," about Afro-Cuban traditions, immigration and artists in the United States, premieres in 2019. He is an adjunct professor of theater at the University of San Francisco. Eli Jacobs-Fantauzzi is a graduate of UC Berkeley and received his MA degree from NYU Tisch School of the Arts. Eli is an award-winning filmmaker and currently directs FistUp TV, a production company that documents people's stories from around the world as a way to expand community awareness around issues of social responsibility and cultural identity. His work has circulated through the National Broadcast: Free Speech TV, Teaching Channel and PBS. He is the co-founder of Defend Puerto Rico, a multimedia project designed to document and celebrate Puerto Rican creativity, resilience, and resistance. Eli is curating his ninth Annual Fist Up Film Festival in the Bay Area, California. His dedication to his craft is deeply connected to his commitment to social justice and the belief in the transformative power of film. Casita Maria is the first and oldest Latino charity in NYC, founded in 1934. The South Bronx-based community arts and educational organization presents diverse, contemporary visual and performing arts and education programming for all ages. Following years of enterprising activity on stage and in the community, Pregones Theater and Puerto Rican Traveling Theater recently merged into a single Latino arts organization with performance venues in The Bronx and Manhattan. The transformation builds upon congruence of mission, values, and programs, and sustained engagement of a growing network of diverse artists and audiences throughout and beyond New York City. Moving forward, Pregones/PRTT champions a cultural legacy of broad impact through (1) creation and performance of original musical theater and plays rooted in Puerto Rican/Latino cultures, and (2) presentation of other artists who share our twin commitment to the arts and civic enrichment.